On May 14, 2009, emerald ash borer (EAB) was discovered in a South St. Anthony Park neighborhood of St. Paul, MN. Agrilus planipennis or commonly called EAB is a serious invasive tree pest, and consequently, is regulated in an effort to slow the spread of the insect to other areas of the state yet to be impacted. The Minnesota Department of Agriculture (MDA) Plant Protection Division tracks the spread of EAB throughout the state and provides outreach materials, training and management guidelines to affected businesses, communities and land managers. Minnesota Department of Agriculture considers May 1 – September 30 to be the flight season for emerald ash borer (EAB). This means that EAB adult beetles are emerging from infested wood or trees and flying in search of new hosts during this time. EAB larvae complete their development by pupating into adult beetles in the spring and early summer. However, this process only occurs when temperatures are sufficiently warm and the whole process requires a certain amount of accumulated heat – i.e., development time. Accumulated heat can be measured and tracked by using degree days which are a measure of time spent above a threshold temperature. Current base 50° F degree day accumulations for Minnesota are available from US degree-day mapping calculator. EAB is an insect that attacks and kills ash trees. It is spread through short distance natural flight and infested firewood transported long distance. The adults are small, iridescent green beetles that live outside of trees during the summer months. The larvae are grub or worm-like and live underneath the bark of ash trees. Trees are killed by the tunneling of the larvae under the tree's bark. Check out this video on the life cycle of EAB. This video was produced with the collaboration of the faculty and students of Art Institutes International and McNally Smith College of Music, with technical assistance provided by MDA, DNR, University of Minnesota Extension and with funding from USDA. What can I do about EAB? 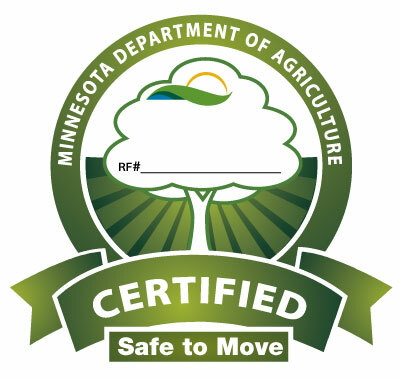 Don't import materials to Minnesota that could harbor EAB such as ash firewood. Remember that it is illegal to move all hardwood firewood outside of EAB quarantine areas. See map of emerald ash borer status in Minnesota. Become knowledgeable about recognizing EAB and remain vigilant to the condition of your ash trees. Stay informed on EAB by signing up to our monthly Plant Pest Insider e-newsletter. 1.) Contact Arrest the Pest via email or by leaving a detailed phone message at 1-888-545-6684. 2.) Send a report through the Great Lakes Early Detection Network App. 3.) Login or create an EDDMapS Midwest account and submit a report. What are the Common Myths about EAB? Myth No. 1. We can’t do anything about EAB anyway; we might as well let it spread. Emerald ash borer is a devastating pest; our choices now for ash trees near an outbreak are either treat or remove. Slowing the actual spread of EAB may mean economic viability for cities that are affected. If nothing is done to slow the spread, EAB can kill all area ash trees in a very short time. Slowing the spread means a city can spend $1M a year on ash tree removal for eight years, instead of spending $8M in one year for all the dead trees. Spreading the costs over many years is easier on any city’s budget, and that city’s taxpayers. Another reason is to buy time to let the science catch up: detection methods are improving and more is being learned about EAB weaknesses. Additional research is needed, but it takes time. While it’s unlikely there will be a silver bullet, if scientists can find enough weaknesses in EAB, we may be able to save ash tree species in the U.S. Myth No. 2. EAB has no impact on human health, it just kills trees. Emerald ash borer killed trees dry out quickly and become hazard trees in less time than after a normal tree death. Hazard trees are trees that can be dangerous because of the possibility of them falling over or large branches breaking off, with a potential to cause personal injury to people. In addition, a recent study by the U.S. Forest Service found that the decrease in tree numbers due to EAB in the Detroit, Michigan area (where EAB started) caused an increase in human mortality related to cardiovascular and respiratory systems.